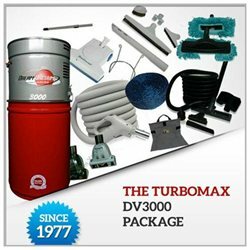 The TurboMax DV3000 Central V..
Top Rated, All Inclusive Central Vacuum Packages. Our complete central vacuum packages are for anyone looking to have a central vacuum installed or replaced in their home. Whether you're looking to do it yourself, or wish to have the builder/contractor install your system, we have what you need. We offer complete packages to add or replace any central vacuum brand. These central vacuum packages vary in what they include depending on your needs.